We’re …seeing channels like mobile grow tremendously. For instance, mobile is now 8% of all conversions that we’re seeing in Google Analytics, and mobile conversions have grown by about 180% in just the last year. @ePrussakov The shocking thing is the number of sites that have no mobile-formatted content. I agree, it is shocking. However, an even more enlightening fact to me is that, apparently, 81.5% of smartphone users find mobile apps more engaging than websites. However dated, here’s another interesting piece the puzzle: about a year ago Kony Solutions reported that they were “seeing over 30% higher conversion for iPhone native app customers vs. mobile web customers” [source, emphasis mine]. Does your business have a mobile app yet? Or at least a mobile website [some guidelines here]? 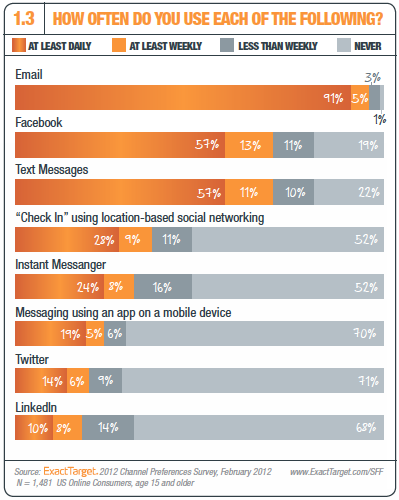 So, 91% check their email daily (and 77% name it as “their preferred channel for permission-based promotional messages”). Additionally, besides what’s also reflected above other studies reveal that between 27% [see here] and 34% [source] of consumers use their mobile devices to check that email. Combine this with Michael Becker‘s recent statement that by 2015 more people will access the Internet via mobile than wire line broadband [video here], and the latter percentages will most likely only increase with time. Mobile is an extremely powerful medium. Combined with email it can exemplify a nearly perfect marketing marriage. Are you keeping the above data in mind? Are your emails optimized to deliver the best experience when viewed on mobile devices? 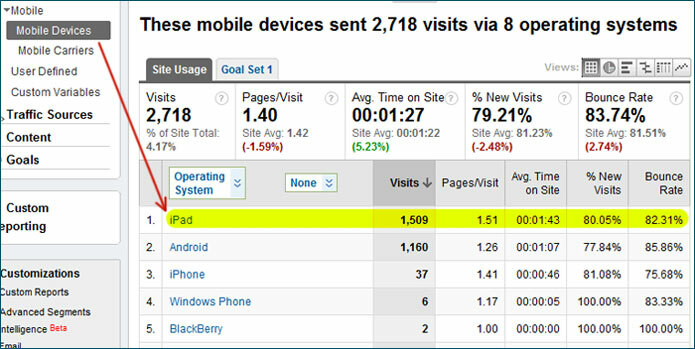 Are the landing pages you’re calling them to visit optimized for mobile? But is this iPad’s tremendous lead really that surprising? If you’ve ever tried browsing the Web using an iPad — having a chance to compare it to a similar experience on any mobile phone — the answer is obvious: the disparity is just as tremendous. Again, the numbers in that fourth chart are hardly surprising! Whether this is because iPad users are more affluent than others, or simply because it is considerably more convenient to shop from an iPad than from a mobile phone; but it does seem like it’s high time to finally introduce a third category — one that would combine tablets (such as iPads, Eee Pads, Nooks, Kindles, etc) and netbooks, segregating them from computers (desktop and laptop ones) and definitely from mobile phones. Happy to hear your thoughts on the subject. That’s what the “Comments” area is for, and should you have anything to add, I’m all ears.